Normally when a car or vehicle leaves a trail of something behind it, drivers would do well to stay as far away as possible. Whatever it is, it doesn’t look good. Trailblazers flips that idea on its head and says, “Driving through this slurry the car in front has just deposited actually speeds your car up!” It’s a great concept in theory, but sometimes I wish it was thick black smoke emanating from the engine, just so I could steer well clear… of both it and this game. Trailblazers’ main premise splits players up into two teams to paint the track their assigned colour. Drive through your team’s on-track deposits and your vehicle speeds up whilst in the boundaries of your colour. Veer away from it, your speed boost ends, and you are unable to boost whilst you are laying your own trails down. You only have a limited amount of this boost to deposit at a time before it needs to be recharged, but a full tank can blast out a track in front of you that also hits opponents to make them spin out of control. That my friends is Trailerblazers’ paint attack. To that end then, you need to enlist the help of a good team to ensure the track remains covered in your colour. Thankfully then, there is local and online multiplayer on offer, allowing you to team up with your mates, because the AI itself must have missed the teamwork memo. This is an incredibly frustrating – and as a result, dull – game as there is simply no teamwork happening when playing through the single player side of things. Every race may as well be a free-for-all with the winning team judged purely on the score of its individual players. And it seems as if the single-player component of Trailblazers is all too aware of this as well, offering a strange way of progressing through the story chapters. But firstly, a note on the story. There is one, and it links the characters and track locations together in a way. But this is a text based affair, and any new speakers are punctuated by their characters unique ‘tick’ whether that could be a frog gargling on something, sentient robots bleeping or blooping, or the female human that seemingly laughs at everything. As you can tell, I’m not a fan of any of these and invariably skipped these ‘cutscenes’. In order to progress on the track though, there is another disappointing mechanic in a list of disappointing mechanics. Each race has three objectives to complete during them and it’s these that allow the player to progress; finishing in last place but with a single objective complete pushes the story mode on in some cases. Some objectives are as simple as performing two paint attacks on your opponents, so when this is all you need to do to move on to the next chapter, there is absolutely no challenge at all. It is worth noting though that further on during the story there are Cup races where final position is of the upmost importance. You just need to sit through 25 chapters of story first, with many of these containing more than one race. Your patience will likely have run out before you even get to the stage where winning matters. Even coming in 1st place does not guarantee a victory though. See, there are a variety of modes on offer to keep things fresh but they all seem to merge into each other – partially because little explanation is given to the differences between each one. Team Racing is the standard game mode, Time Trial has you putting yourself up against the clock so you paint your ideal line and then gun it for the finish line, but the worst of all is All vs All. 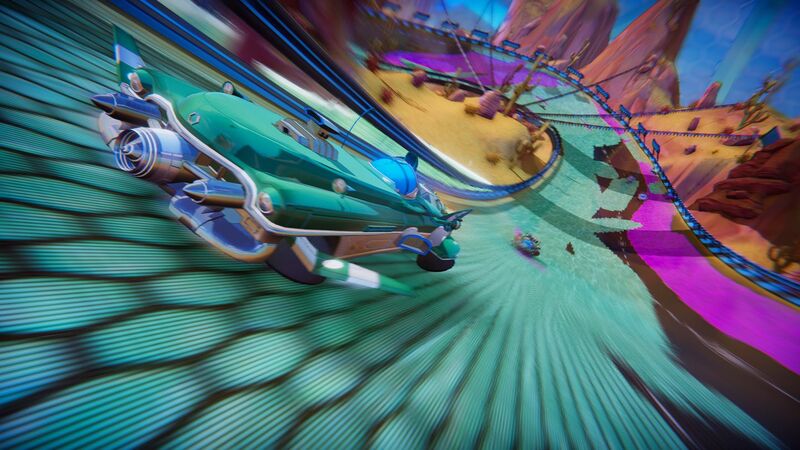 It is here where each of the six players have their own unique colour, but with six drivers all using the same racing line it’s virtually impossible to gain any speed boost as it’s immediately painted over. Even the music gets tiresome quickly, although I will admit that the funky tracks had me invested upon first hearing them. 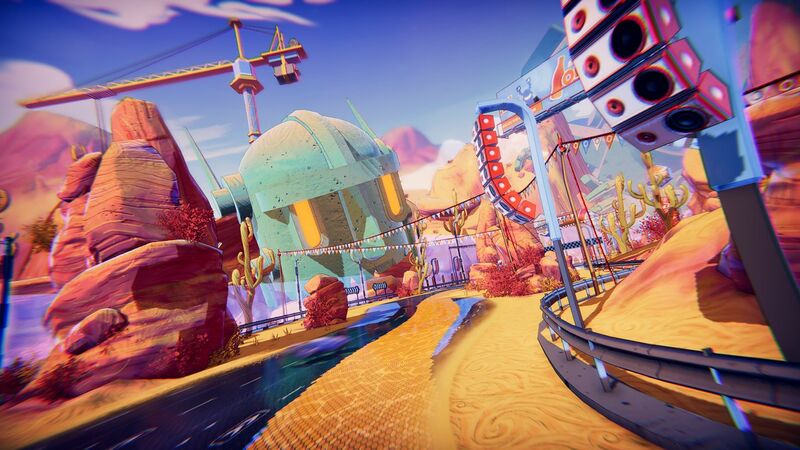 Each track has its own specific musical accompaniment too, but with limited race tracks to choose from, you’ll hear the same songs repeatedly and it won’t be long before you begin to reach for the mute button. 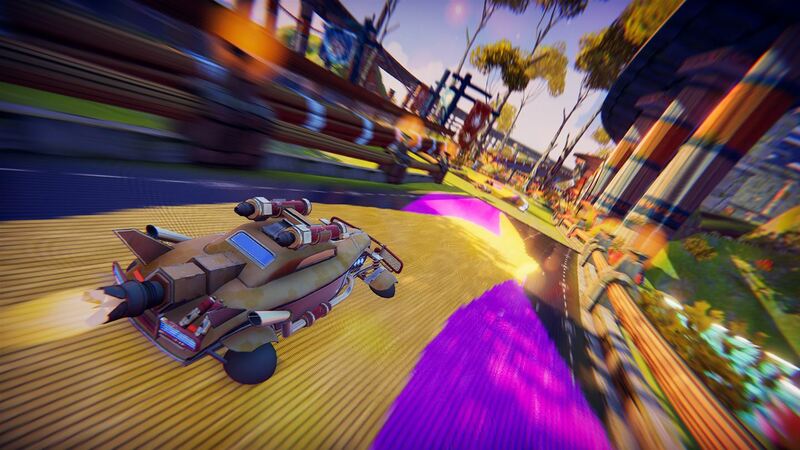 The race tracks that are on offer are well designed mind; most have a section of them that is split into three lanes and it is within these areas where you can deviate a little from the racing line and try and catch up your opponents, or put them further behind. It has to be said that they are varied enough with plenty of shortcuts and split routes. Just like everything else in the game, the achievements are a real mixed bag. There are only 12 to unlock ranging from the standard offerings such as winning your first race or taking down fastest laps on certain tracks. But then there are also some really bizarre ones like finishing three laps in a row in second place, or even weirder for finishing every lap of a race in sixth place with a certain character. They are certainly varied but the sixth place one for example is worth 25G and requires zero effort. Anyone can be rubbish when gamerscore is on the line. 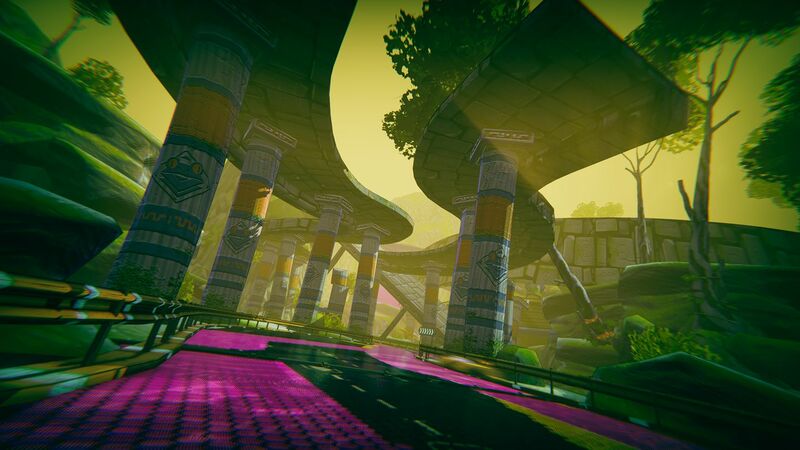 At the end of the day, Trailblazers is a hugely interesting concept clearly borrowed from Splatoon, but its execution here is lagging far behind. Weirdly though, I feel the developers have done their absolute best with the concept, but it just hasn’t worked well at all, especially in the solo mode. This then has a knock-on effect for the online lobbies – because no one is willing to try it because of the disappointing single player – and as such the multiplayer side of things is already empty. Hell, even the local multiplayer is disappointing when you need to use the AI. What does work though is when you get a room full of friends willing to experiment on racing lines, and that is when Trailblazers comes across as tons better.